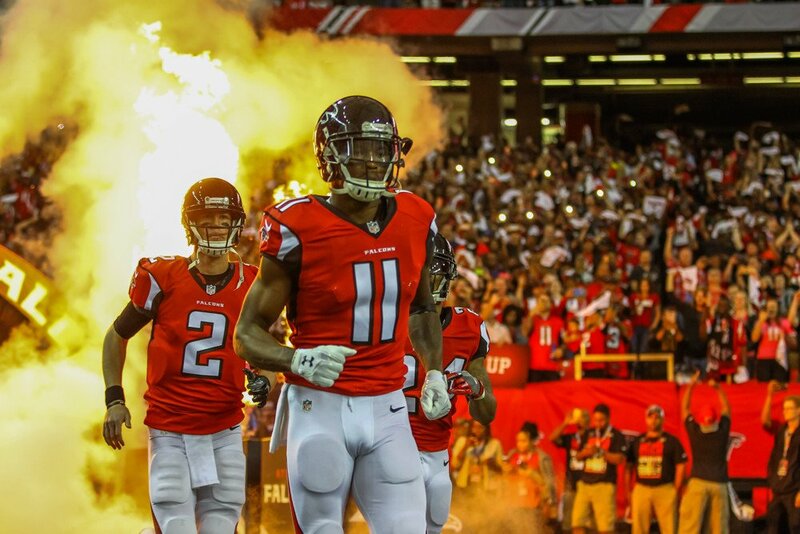 For the third year running, Julio Jones dominated the wide receiver landscape in the NFL. He finished 2016 with 83 receptions, 1,409 receiving yards, and 6 touchdowns. This marked Jones’ third consecutive season over 1,400 yards receiving. Jones is currently being drafted 1.05 overall in fantasy football ADP. Data is from 12-team standard mock drafts. 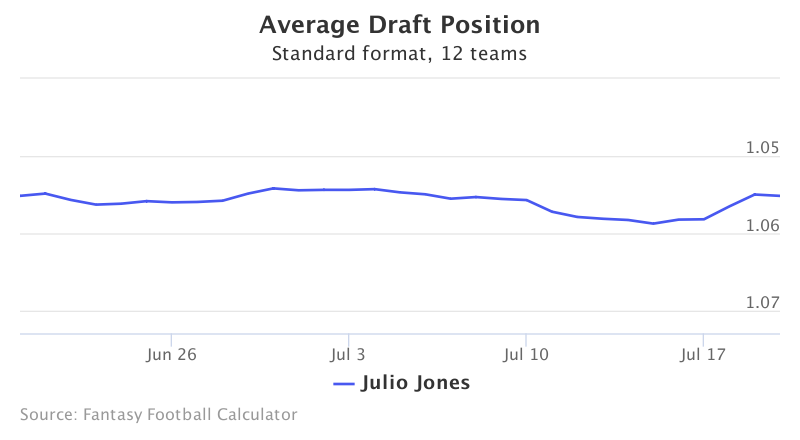 Jones’ ADP has remained constant over the past month, due to his immense floor and league-winning ceiling. Throughout his career with Atlanta, Jones has been an absolute monster, averaging 96.3 yards per game. The past three seasons he finished with 164, 204, and 129 targets respectively. This resulted in elite target shares of 30.9, 32.9 and 27 percent. On these target shares, Jones could not be stopped, finishing with 679 (1st) yards after the catch in 2015 and 410 (9th) in 2016. This effectiveness stems partially from Jones’ role as Matt Ryan’s go to deep threat. According to Pro Football Focus, Jones ranked 1st in yards per route run with 3.12 and 6th in deep targets with 31. On passes traveling more than 20 yards down field, Jones also grabbed 401 yards (5th). To put icing on the cake, he had the 4th highest contested catch rate in the NFL at 90.9%. Aside from missing a few games due to injury, Jones’ main concern remains his red zone usage. In 2016 he saw a red zone target share of a mere 11.8% (94th) on 14 targets. In this area he was out-targeted by Mohamed Sanu (18 targets) and Devonta Freeman (19). While this is concerning, there is room for optimism going into 2017. New Offensive Coordinator, Steve Sarkisian, said he would like to utilize Jones increasingly in the red zone. Going at 1.05, Jones is coming off the board between Antonio Brown and Odell Beckham. Arguments can be made for selecting each of these players as the top wide receiver. With this in mind, Jones becomes a must draft if he falls anywhere below his current ADP.